Yesterday saw the launch of Kenya Red Cross Society’s app that they were keen to describe it as the world’s most advanced humanitarian aid app, once again putting the nation at the forefront, using technology to bring humanitarian services closer to the people of Kenya. The application, which is available on both Android and iOS platforms, was developed and is powered by Connectik Technologies Limited, who provide a collaboration platform that connects an enterprise with its management, employees, customers and partners in an open cross-platform, cross-channel ecosystem. Sponsorship for the development came from Willful Capital with the support of the International Federation of Red Cross and Red Crescent Societies (IFRC). 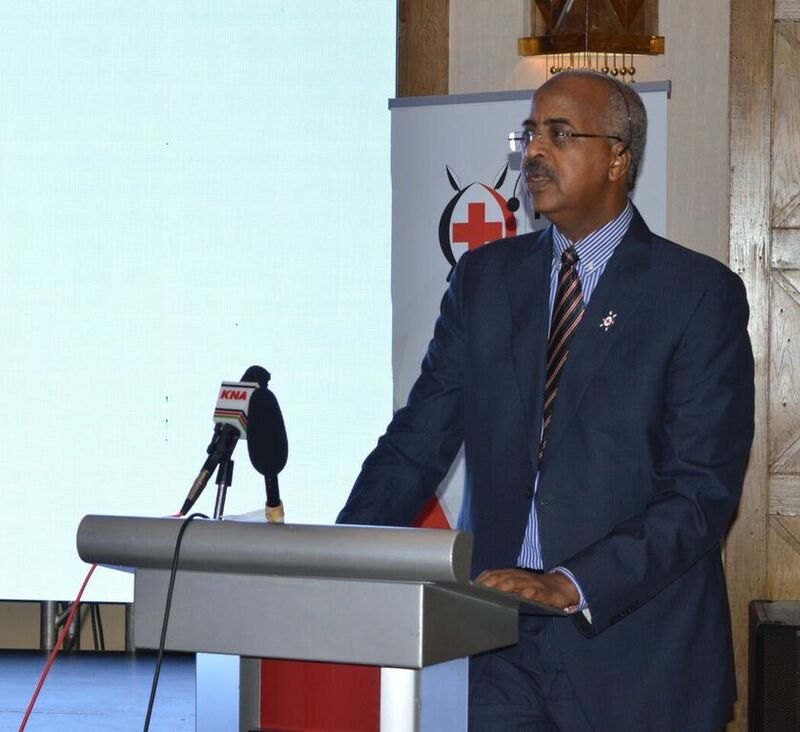 There are three main features that Dr. Abbas Gullet, Secretary General Kenya Red Cross Society wanted to focus on; the ability of its users to get emergency services at a touch of a button, get emergency news and alerts and the ease of finding blood donation points. So other than that, what is in this application that makes it stand out from the rest? Dubbed as the most advanced humanitarian app, I am curious to find out and share with you what exactly it has that will make it Kenya’s next frontier. What can you do on this App? These are two different features on the app, but I can put them in the same category. Basically you should be able to get real time and possibly lifesaving information during a crisis or an emergency situation. I normally wait to receive Red Cross Tweets when there is an emergency situation in order to get accurate, or even truthful accounts of a situation. Sometimes, you just cannot trust tweeps in Kenya. They are obviously arranged in a chronological order and when you click on an alert, you can get more information about the situation. You can also donate some money to help allocate some resources needed for that situation. This is definitely much better than the present way for reading a tweet where information is simply a broadcast and user cannot chip in or learn more. This makes a lot of sense to me. Now on the KRCS News section, imagine it as a blog section for KRCS whereby they give some reports of things that they have been involved and activities that they have participated in. So basically the whole idea here is to keep you up to date with all that they do. Is this relevant for everyone? I do not think so. I don’t know, unless you have enrolled to be a member of Kenya Red Cross Society and have a stake in it, then it makes sense to follow that up. This is probably a feature I will not be too keen on. Ambulance, Blood Donations and supporting Kenya Red Cross. These are the next three features of the app, and by far the most interesting and curious is the feature that enables you to get emergency services easier. So you need an ambulance, well open the app and request for one. Not only can you call for an ambulance, you can take a picture of the situation, give a brief description, identify the incident type, like whether the person as fainted, unconscious or talking and lastly, you can add your location or any other just in case you want to request an ambulance for somebody else. Now this is useful, I love the implementation of this, though I cannot help but think of Mobile Life. What is Mobile Life you ask? Well it’s an app created by some brilliant minds which does something similar. It aims to get you the appropriate emergency service response in relation to what is happening. This includes ambulances, firefighters and police. It is a brilliant application but it needs the support of emergency service responders like Kenya Red Cross, but they went ahead and created their own. Sigh! Kenya Red Cross Society is hoping to increase levels of blood donated by highlighting the various donation points and their proximity to app users in order for them to easily donate. Blood is always an issue at Kenya Red Cross with a demand of 70,000 pints of blood monthly and being unable to fulfill that. Hopefully this makes that better. You can also donate some money to Kenya Red Cross Society through the app by either using MPESA, Airtel Money or Credit/ Debit card. Volunteering, Membership, Training and Projects. Kenya Red Cross Society is an intricate network of volunteers and first responders who provide the much needed man power needed in times of crisis. According to Dr Abbas Gullet, bringing the volunteers together and sending them real time updates has not been easy and through the app, they will be able to inform and send them alerts when appropriate. If you wish to be a volunteer, you can do so by inputting your data and they will contact you directly. Kenya Red Cross Society is a membership organization, meaning it largely relies on members to fulfill its mission. Therefore on the app, you can enroll to different membership levels from Youth member in school paying Kshs. 100 annually to Life Membership at Kshs. 5000 one –off. During the launch, Safaricom CEO, Bob Collymore and Cabinet Secretary for ICT, Mr. Joe Mucheru signed up for lifetime membership and got some badges. Now will you receive the same from Dr Abbas Gullet when you sign up for Lifetime Membership? I highly doubt it. You can also enroll for training via the app. Training includes courses in advanced trauma life support, advanced cardiac life support, disaster management courses, basic fire safety among many others. I mean this app is full of layers of features such that not only can you sign up for the classes, you can also navigate to the location where the course is offered. I wish however that I could access some tips and basic free training on the app in order to use I emergency situation before trained help arrives. Lastly, there are many ways to support the Kenya Red Cross Society. One of them is buying merchandise from them. You can access the market place on the app and be able to purchase stuff but I do not think they are able to deliver, I stand to be corrected. As you pay, you are prompted input when you will be available for pick up, hence the conclusion. Another way to support the Kenya Red Cross Society is to stay at one of their luxurious Boma hotels and all proceeds go straight into financing the society. They make the booking accessible via the app, however, you are redirected out of the app and into the Boma Inn website’s section for booking a room. Therefore it isn’t exactly booking through the app, rather making it accessible, if that makes any sense. Well, I went into this expecting something quite shallow to be honest. Having first interacted with Mobile Life, I felt like maybe Kenya Red Cross Society kind of rushed this in order to come to market before Mobile Life, and being as big as they are, a presence in the app world is all that they need. But after using this, I got to appreciate the work put in this. Let us imagine they rushed to build this, it doesn’t show. It seems deliberate and intentional. I was, to say the least impressed. The features available on this app are so vast, I do not think I have discovered all of them. Maybe this can be a bad thing, if at all you have so much choices, won’t some go unattended. Another thing on the downside of this app is the fact that it is limited to smartphones running Android and iOS. The Kenya Red Cross Society has nationwide reach, therefore limiting it to only a small percentage of people. Feature phone use is vast, they should find a way to incorporate that too. Should the very countable Windows and Blackberry users also get their version? I mean Facebook stopped Blackberry support, so maybe that is a sign. Be sure to download the app and see how and if you can add it in your daily life. Next articleDid Social Media Bring Chase Bank Down?